At the 2007 Winter NAMM show, Alesis introduced their USB Mic Podcasting Kit. 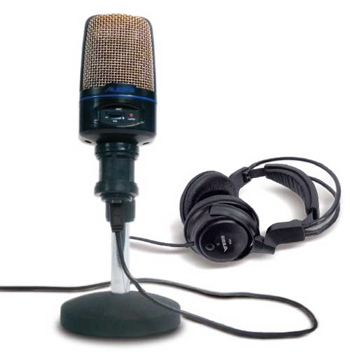 According to the company, the USB Mic Podcasting Kit allows even the most inexperienced users to quickly record audio into the computer and have their podcast heard on the Internet. Just plug the USB microphone into your computer – the microphone is a plug-and-play device, so there are no drivers to install. The kit includes Audacity for recording your audio and is compatible with both Windows and Mac operating systems. Once you have finished recording your podcast, the custom Alesis Podcast website allows you to upload your audio and will host your podcasts for free for 30 days. The USB Mic Podcasting Kit provides 16 bit / 44.1-48kHz audio. A desktop microphone stand and headphones are also included in the kit. Interesting news. Seems like Samson has a little competition in the USB microphone business. For those skeptical about USB mics, We have been using one on our Podcast http://childrensbookradio.com for a while now and the sound is pretty good.